Guilty pleasures. I have a thing for games and movies that other people dislike. This goes back to the old school days of Nintendo and one of those games that I loved was Deadly Towers. I played it when it first came out and back then, it was one of the most difficult games around. I'd always been curious about the development of the game and was real excited to find the Nintendo Producer for Broderbund, Alan Weiss, who helped port the original game. Alan was kind enough to take the time to do an interview about his role on the game, share some trivia about the development, and talk about some of his experiences working on other iconic titles like Myst, the two-player version of Lode Runner,and another favorite of mine which I consider criminally underrated, Secret of Evermore. Before I jump in, let me share a little bit on my thoughts about Deadly Towers. Whatever Nintendo game I got back then, I was stuck with for six months to a year. That meant if I got a game that took me one hour to beat, that was it. Pretty disappointing, right? One of the things I loved about Deadly Towers was that it took me forever to beat. That was in part because of its sprawling environment with serpentine dungeons and action-RPG elements that allowed you to power up Prince Myer as he destroyed the seven bells in the eponymous towers. It was one of the first games with an opening cutscene and a storyline that seemed to imply that a lot more was at stake. When the prince first began, his dagger barely fired across the screen. Your greatest enemy wasn't the blobs of slimes or the weird pixels of dust in your way. Rather, your agility, or lack of. With new acquisitions, the weapons not only got faster, but stronger. So did your armor and speed. I know one of the biggest complaints was the lack of direction in terms of knowing where to go (AVGN had a pretty funny video critiquing the game). I actually enjoyed wandering through the labyrinths with their hundreds of rooms. I lost passwords, died thousands of times, and wasn't a fan of the jelly ball tower enemies (officially called 'Bounder Towers,' though they did give a lot of ludder which was the currency in that world). I found the enemy designs strangely unique and liked the way Myers powered up into a badass (relatively speaking, of course). There was a strange tranquility in the hopelessness of my plight that, with time, became less impossible. I don't know how I did it, but I beat Deadly Towers as a kid. I'd say it was arguably the hardest game I beat-more than Ninja Gaiden, Fester's Quest, Ultima: Exodus, Blaster Master, and the original Phantasy Star-and for that alone, it has a special place in my gaming heart. I'm including this link of a playthrough of Deadly Towers that I found amazing. First off, can you talk about the development/porting cycle and your role in the project? I know the game was developed by Lenar and published by Broderbund. How did that relationship come about and what was the process like? Alan Weiss: Our relationship with Lenar was facilitated by Scott (Kenji) Tsumura, who worked for IREM and eventually worked for Broderbund to form the Kyodai Software division. We would get games from Japan, sometimes through contacts and sometimes by buying them in Tokyo ourselves, to evaluate for publication. I was fortunate to be the only Nintendo Producer at Broderbund so all product development was managed by me. After agreeing to publish, we worked with Lenar to translate the text and get it implemented. I'm not sure why I kept the strange name Prince Myer but at the time I was trying to make faithful conversions and didn't feel I should try to "Americanize" it - in retrospect, I wish I had taken a few more liberties with this process. The Japanese person I worked with on the translations eventually ended up working for Apple on the Newton handwriting recognition. I went to his house in Silicon Valley and he read the text into English while I wrote it down. In addition, at Broderbund I was fortunate to be able to work with Will Wright on his first game, "Raid on Bungeling Bay", to which I added the idea for the seven variable newspaper endings based upon your success rate. I was also the Product Acquisitions Manager and helped to bring in two huge game submissions while performing that job, MYST and KidPix - both extremely successful products for Broderbund. You also mentioned the Japanese name? 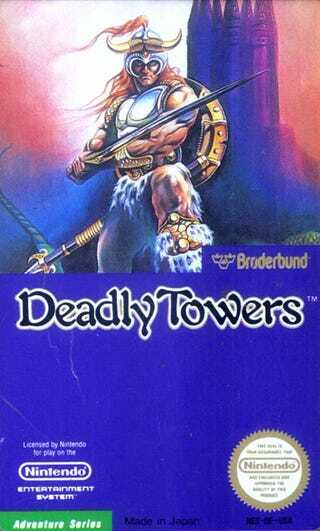 How did you guys settle on the name, Deadly Towers? AW: The original Japanese name was translated to me by Scott Tsumura as "Devil's Ring" - but strangely I never could find the "ring" in the game? It was only after publication that I learned that the actual translation was "Hell's Bells", which made sense with the bell towers in the game. To name our games, we would ask people in the company to play them and offer suggestions. I believe "Deadly Towers" came from my boss at the time, Ed Bernstein, who was formerly a writer/editor with the local paper The Independent Journal. I thought it was great that after Sean Reiley called Deadly Towers the worst Nintendo game of all time, you actually wrote in to him and had a great sense of humor about it. What are your thoughts on the game all these years later? AW: Looking back on the game I have to agree with some of the criticisms. I don't think it was our strongest Nintendo title that we published. At the time it was interesting and competitive but in retrospect it is a pretty repetitive game. One of the biggest criticisms is how frustrating and difficult many of the puzzles are. Was that an issue that ever came up while the game was being brought over? AW: We did a lot of testing of the game and we didn't actually find it that difficult at Broderbund, and I think we wanted something more challenging than previously published titles to round out our portfolio. I actually think "Legacy of the Wizard" was a more challenging game (and much more dynamic). Deadly Towers was a best-selling game during its release and in the end credits, it seemed to hint at a sequel. In the manual and the text cutscenes, a huge backstory is hinted at. Was that ever in the works? AW: As far as I know, there was never a sequel to "Hell's Bells" (Deadly Towers). It was probably wishful thinking by the designers at Lenar that they be given a sequel. I did notice a couple of embarrassing typos in the end credits/text when I went back and reviewed it which was surprising to me. Finally, after Broderbund, you've had a lot of incredible experiences, design producing at Squaresoft (can you tell us which games? ), producing at Psygnosis, and currently an executive producer for IGT. What are the biggest changes you've seen in the gaming industry and where do you think it is heading? Peter Tieryas blogs at tieryas.wordpress.com and can be found on twitter at @TieryasXu.